The Historic Centre of Bukhara is the most complete and unspoiled example of a medieval central Asian town, which urban layout and buildings have had great influence on town planning in Central Asia. Whole districts with their ancient layouts have been preserved to the present day. The city's history started in the 4th century BC, growing into one of the largest cities of Central Asia. Most major monuments that have survived are from the 16th century onwards, the Sheibanid period, when economic and cultural development was stimulated. 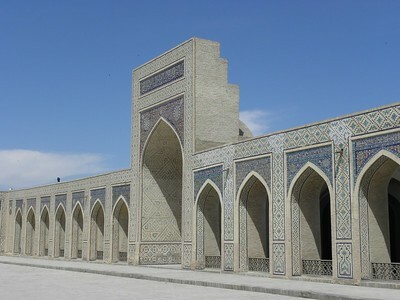 Bukhara was also the largest center for Muslim theology in the Near East. Undoubtedly my most powerful memory of Bukhara is sitting at the square, gazing at the Kalan minaret. It is so perfectly shaped. The adjoining mosque is another masterpiece. The same can be said of the little Ismail Samani mausoleum, dating from the 9th-10th century, and the four turrets of the Chor Minar. Bukhara is a great destination: compared to the other Uzbek sites it is more lively than Samarkand and less museum-like than Khiva. It has a lot on offer from different periods and merits a visit of at least 3 days. In the evenings you can relax, eat and drink on one of the terraces around the Lab-i Hauz pond. This area especially has become touristy, as have the bazaars. Although Uzbekistan cannot be considered a major tourist destination, enough of them come here to provide a living for the many restaurants, hotels and souvenir sellers in town. Part of the WHS is also the 16th century women's hammam. It was my first visit to a hammam ever and a memorable experience. Imagine sweating away in a 500 year monument that has been used by many many women in this period. At first I was still in my "visiting a monument"-mode, just admiring the heated cells covered all over with large dark gray stones. The image then was completed by the arrival of several very fat naked Uzbek women, scrubbing each other or lying on the cold floors pouring buckets of water on themselves. It is rare that one still can see life as it was centuries ago. And become a part of it, as I was washed from top till toe by a small Uzbek grannie. I visited this WHS in June 2017 and spent 4 nights here. Like Samarkand, to me it is one of the top WHS on the list and certainly Uzbekistan most lively WHS. Unlike Samarkand, the medieval atmosphere is still alive and if you wake up just after sunrise and wander through the residential areas or market area you will notice that not much has changed. I really enjoyed watching the local children meet up just after sunset in front of the active Miri Arab Madrasah (photo) to play football beneath the Kalyan minaret. The restoration works were much better than Samarkand and much of the historic centre has been preserved (not only single sites or monuments). 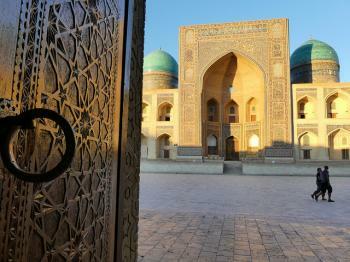 In Samarkand, I wasn't able to find one single mention of UNESCO anywhere. Here every inscribed building (as well as those on the tentative list!) have a plaque and then there is a bronze plaque with the inscription certificate engraved just in front of the Hoja Nasruddin statue. During one of the days I visited, on the last day of Ramadan, many Muslims came from all over the province for the community Iftar, the evening meal when Muslims end their daily Ramadan fast at sunset. The Kalyan mosque was full of people eating and celebrating during that evening but apart from that time, in Summer locals seem only to go out early in the morning to buy local produce at the market and after sunset. Another highlight during my visit were the local hammams or bathhouses, some of which are still in use. The evening when the iftar took place, an elderly woman was cleaning the women's only hammam just behind the Kalyan mosque and while convincing my partner to come the following day, she let me in to take photos. The architecture is very similar to the bathhouse in Khoja Ahmed Yasawi in Kazakhstan and it's incredible that such a place was still being used till nowadays. The best panoramic viewpoints (for sunset) are either at the terrace bar in front of the Kalyan minaret where they serve excellent tea or else from on top of the Ark citadel wall remains (by paying around 5 euros to the guards an hour or so before sunset). The latter view is my favourite and I was very lucky to find a local master who painted that same view on canvas. I can enjoy this same view and remember my stay in Bukhara every night before I go to sleep, as the painting is hanging in my bedroom. There are some talented artists in Bukhara and if you plan to buy any souvenirs, do so at one of the domed bazaars: Togi Telpak Furushon, Sarrofon or Zargaron. The most iconic building is perhaps the Chor Minor, a unique madrasah possibly built to resemble the Char Minor Mosque in Hyderabad, India. Best time to visit is in the afternoon and it is also possible to climb near the dome just beneath the 'four minarets'. All tourists and many locals, enjoy their evenings near the Khanaka and Madrash of Nadir Divan Beghi (the one with the pond with wooden miniature Bukhara monuments floating on it - the place is known as Lyabi-Hauz). I really loved the beautiful Semurgs (legendary birds of happiness) which adorn its entrance arch. Bukhara is now connected to Samarkand and Tashkent with the Afrosiyob fast train and soon it will also be connected to Khiva. All three WHS are very special for different reasons and it would be a pity to just visit as day trips. The more time you spend here, the more you can explore at leisure and revisit at different times of the day. The food is delicious too so you'll be able to try the different plovs and local dishes! Located in the middle of Kyzyl-Kum Desert, Bukhara, a historic city on the great ancient Silk Road, is liked a mirage from the Arabian nights fairly tales with many outstanding monuments that easily take your breath away. Seeing monuments of Bukhara is quite straightforward as all important sights are located in single tourist routes from the amazing brick mausoleum of Ismail Samani to great Kalon Minaret complex with inspired Kalon Mosque and end at the photogenic four towers of Char Minar. Other monuments are also worth mentioned, the wooden carving columns of Bolo-Hauz Mosque near the Ark Fortress are just gorgeous, the newly restored façade of Abdul Aziz Khan Medressa is so unbelievably colorful that you may think that you are in India’s Rajasthan and truly one of my favorite, and the relaxing area of recently renovated Lyabi-Hauz with the nearby beautiful mosaic of Nadir Divanbegi Medressa. The well preserved bazaar buildings are exceptional with the sophisticated roof. However, similar to other places in Uzbekistan, almost all Bukhara’s religious monuments had been turned to souvenir complexes and restaurants which sometime really destroyed the atmosphere of the place. As mentioned the Lyabi-Hauz area had been renovated as well as many areas in the old city, those areas are very clean and so well organized liked the museum city of Khiva, which totally contrast to un-renovated of Bukhara. In my opinion, Bukhara has potential to become second Khiva, which I don’t think a good example as the city will become lifeless. By the way in terms of WHS, Bukhara is a great world heritage city with world class monuments and should be on everyone itinerary. 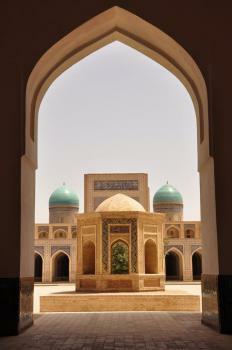 We have visited Bukhara twice, once in Soviet days (1983) and again in Oct 2004 – and what a difference! Free enterprise has turned a dour dusty “museum city” into a lively “Persian (or rather “Uzbek”!) Market”. In Soviet times all tourists stayed at the Intourist run Bukhara Hotel in the new town. We went to visit it for “auld lang syne” and found it now very down market (although even in Soviet days it had become infamous as the seat of a cholera epidemic which attacked western tourists!) and seemingly only used by locals. Its restaurant, where we had waited for so many hours to be served unappetising food by surly waitresses, was closed and empty of tables. The deserted foyer still exuded its tacky Soviet persona with its cheap wood veneers and decorations. The Intourist Souvenir stand which sold little, apart from those Russian dolls which fit inside each other, had a film of dust on it and its glass fronted shelves were even emptier than they used to be. A real “time warp”! Instead a number of new private hotels have been built or converted from old city buildings but, as yet no “chain hotels”. Restaurants had appeared, catering for a range of levels and tastes (even including an Italian!). The old domed covered markets were full of shops selling carpets, carved woodwork, embroidery, metal-ware, pottery, Astrakhan hats etc etc. One wonders where the craftsmen had been hiding during those long Soviet years –the quality of the work often seemed very good. Entire madrassa buildings had been turned into markets while others were active in Islamic studies. The buildings were as fine if not finer than we remembered them (restoration has been going on but had not sanitised the place as much as Khiva). On the whole we felt that the changes had given the city the “life” it had lacked in Soviet times. In the evening we watched a few students from a madrassa playing football in their robes in the otherwise peaceful main square next to the “Tower of Death” as the sun cast a superb light on the blue tiles and red stone of the buildings. The sunset view from the top of the tower (closed on our previous visit) was magnificent. The people everywhere were friendly. We hope that Uzbekistan will emerge from its current troubles and that Bukhara will remain available for visits – it is undoubtedly “world class”. The inscription would only take effect if and when the tentative list of Uzbekistan is presented (it was only present at USSR Tentative List). They did so in 1994. 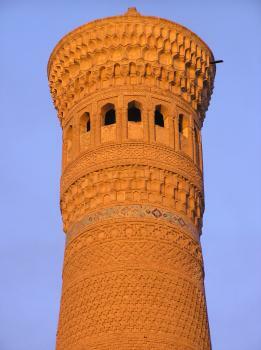 Places of Execution: The Minaret of the Kalon mosque. "For here, on market days, particularly outrageous criminals were led up the 105 steps of this 'Tower of Death', whereupon their crimes would be enumerated to the transfixed crowd, the omniscient justice of the emir praised to the heavens and the accursed criminal tied in a sack and thrown off the top to hurtle to certain oblivion below. The gruesome spectacle was current well into the second half of the 19th century"